I'm not a gamer, but a segment in last week's On The Media, Personal Video Games, inspired me on several levels, offering insights into the ways that game designers are utilizing their craft to enable others to more effectively relate to their personal trials and tribulations. I've long been fascinated with the stories we make up about ourselves, and even though I rarely play online games, having played the games mentioned in the segment, I can appreciate how adding an interactive dimension can make the heroes' journeys embodied in those stories more accessible. While I can't personally relate to being or becoming transgender, I can relate to several challenges that arise in accompanying a loved one on an interminable health odyssey such as the one embodied in the game: struggling with difficult decisions about medical procedures, dealing with the labyrinthian medical industry, interacting with friends and family who want to help but don't fully understand, coping with [someone else's] mood swings and experiencing varying levels of hope and despair about whether things will get better. Michael Molinari designed the game, That was Yesterday ("A personal journey about learning to move forward in life"), to embody a different type of transition, his move from a small town in New Jersey to San Francisco to take a new job (designing games). I have to admit that I was skeptical when I first heard his description of the game, which depicts "a wall you need to face away from, and in order to get through the wall, instead of bumping your head against it, you need to look to the past and find all the things that help you drive forward ... When you face away from this wall, which kind of represents problems and fears and whatever, you think it might be this dense wall, and it kind of recedes and moves back. The key there is to exercise patience and wait for the wall to disappear, and once it's off the screen, then you're able to turn around, face forward and start moving through life a little bit further." Even playing the game, I found it disconcerting that the only way to "win" - i.e., avoid being blocked by the wall - was to turn away from the wall, which I initially interpreted as a form of denial. However, upon further reflection, I could see how the game might represent the wisdom of the serenity prayer: grant me the serenity to accept the things I cannot change, the courage to change the things I can, and the wisdom to know the difference. One of the new dimensions of awareness that my wife and I have learned about functional gastrointestinal disorders is the tight loop between stress and disease, and how sometimes the best solution to dealing with the angst of not knowing the source of or solution to recurring bouts of pain and discomfort is to just let go ... to figuratively face away from the impenetrable and implacable wall. The danger of this scenario is that the act of feeling frustrated is an essential part of the creative process. Before we can find the answer — before we can even know the question — we must be immersed in disappointment, convinced that a solution is beyond our reach. We need to have wrestled with the problem and lost. Because it’s only after we stop searching that an answer may arrive. Sebastian Janisz designed another game about beating your head against a wall, Lackadaisium, which embodies his struggles with depression and loneliness. "I started making it just to kind of relieve myself, because I was feeling all this emotion, or more like a lack of emotion. I thought maybe making this game would make me feel better. Essentially, what I wanted to try and do was make it so that when you play it, because of the way the game play is designed, you'll start to feel how I felt." Unfortunately, the game only runs on Windows platform, and I'm a Mac user, so I have not yet played this game, but I can certainly relate to struggling with depression and loneliness. Several insights and connections emerged throughout the interview. Anna's observation that games are about rules reminded me of the pervasiveness and permeability of finite and infinite games that I first discovered via James Carse. Sebastian's observation that he made the game for himself, and Michael's surprise that when others play his hybrid semi-autobiographical game, "some people had more personal experiences than I even had when I was making it", both reflect Carl Rogers' wisdom that what is most personal is most general. The raw vulnerability embodied in these games provide compelling examples of authentic player journeys - vs. trendy and shallow gamification - that Amy Jo Kim has articulated and championed so effectively. Finally, Anna's closing observation - perhaps elaborated further in her book, Rise of the Videogame Zinesters: How Freaks, Normals, Amateurs, Artists, Dreamers, Drop-outs, Queers, Housewives, and People Like You Are Taking Back an Art Form - that amateur games can be viewed as both an art form and a reaction against the creeping conservatism of the game industry reflects the rise of the do-it-yourself movement, and raises the possibility that game design may provide a compelling channel for following Doug Rushkoff's exhortation to Program or Be Programmed. Two of the most interesting and provocative books I've encountered recently are Alone Together: Why We Expect More From Technology and Less From Each Other, by Sherry Turkle, and Reality is Broken: How Games Can Make Us Better and How They Are Changing the World, by Jane McGonigal. I have not finished reading either book, but I've read numerous articles and reviews about both books, and my general impression is that Alone Together expresses concern that our increasing focus on virtual interactions is draining, depleting and distracting us from our real-world interactions, whereas Reality is Broken espouses the belief that the time we spend playing online games can renew and revitalize us and perhaps even lead us to redirect our energies toward solving real world problems. These days, insecure in our relationships and anxious about our intimacy, we look to technology for ways to be in relationships and protect ourselves from them at the same time ... Sociable robots and online life both suggest the possibility of relationships the way we want them ... But when technology engineers intimacy, relationships can be reduced to mere connections. Borrowing some of the language and insights shared by Brene Brown's TEDxHouston Talk on Wholeheartedness, I would characterize Turkle's book as inviting us to be more willing to lean into the discomfort of real-world interactions and embrace the courage, vulnerability and authenticity needed for meaningful connections with people IRL (in real life). As technology increasingly co-inhabits more of our physical spaces - and inhabits increasingly human-like or animal-like robots in our midsts - we need to develop a more disciplined approach in balancing our online and offline interactions. During her January 17, 2011 interview with Stephen Colbert, Turkle summed this up by saying "we have to put technology in its place". McGonigal offers a more positive perspective on the value of online interactions. In a Wall Street Journal article on The Benefits of Videogames (adapted from her book), she implicitly questions whether we ought to lean into discomfort of real life, and promotes the embrace of the relatively friction-free engagement more readily available in online games. Gamers want to know: Where in the real world is the gamer's sense of being fully alive, focused and engaged in every moment? The real world just doesn't offer up the same sort of carefully designed pleasures, thrilling challenges and powerful social bonding that the gamer finds in virtual environments. Reality doesn't motivate us as effectively. Reality isn't engineered to maximize our potential or to make us happy. However, while McGonigal advocates the benefits of gaming and online interactions, she does not turn her back on real life. During her February 3, 2011 interview with Stephen Colbert, she noted studies showing that "the emotions we feel in games spill over into our real lives", and describes a game, Evoke, that she designed to promote the creation of social enterprises to solve real world problems such as poverty and hunger in sub-Saharan Africa. I don't believe that McGonigal believes that reality is completely broken, nor do I believe that Turkle believes that virtuality - sociable robots and online interactions - is completely broken. However, each expresses a very different point of view about the relative costs and benefits of online vs. offline interactions. I recently posted some slides I used for a guest lecture conversation on human-robot interaction in a human-computer interaction course at the University of Washington, Tacoma, which reference Alone Together and Reality is Broken, as well as a number of other ideas and perspectives on the topics of interacting with humans vs. robots and online vs. offline. Shortly thereafter, the current issue of ACM interactions magazine arrived, reminding me about a Social Media forum that I now edit in the magazine, which may offer an ideal venue in which to host a debate between these two inspiring authors. In my introductory article - which appears in the current issue (Bridging the Gaps between HCI and Social Media, which has not yet appeared is now available online) - I wrote about my intention to use the forum to reflect the conversational nature of social media, and to bring together short and potentially conflicting contributions by multiple thinkers and doers on topics of interest to the HCI community. I'm hoping I can convince Sherry Turkle and Jane McGonigal to participate in an upcoming forum, as I think the insights and experiences they offer would be of great interest and benefit to the ACM interactions community. If you agree that this would be a worthy endeavor, please feel free to tweet a link to this post and CC @STurkle and/or @avantgame. Jaron Lanier recently wrote about virtual reality and its potential application to learning, utilizing some evocative terms and offering an educational scenario that reminds me of a seminal 1997 paper that described how a Nobel prize-winning biologist fused with her objects of study. The Saturday Wall Street Journal article gave me a keener appreciation for the potential applications of virtual reality (VR) - immersive computer-generated environments that model real or imaginary worlds - and for the pervasiveness of object-centered sociality, a concept I first encountered via Jyri Engestrom. Lanier's article is about new frontiers for avatars - "movable representations of ourselves in cyberspace" - and how they can be used to manifest somatic cognition - the mapping of human body motion "into a theater or thought and strategy not usually available to us" in which one's hands (or presumably, other body parts) can solve complicated puzzles more quickly than one's head (or conscious mind). The examples he gives of somatic cognition outside the realm of virtual reality include professional musicians, athletes, surgeons and pilots, and I found myself thinking of a documentary I saw years ago on heavy machinery, and the way that a crane operator who was interviewed described the bewildering array of levers as virtual extensions of his arms and hands. After describing a software bug in an early VR system that gave his humanoid avatar a gigantic hand, Lanier generalizes homuncular flexibility as a more general principle: "people can learn to inhabit other bodies not just with oddly shaped limbs [gigantic hands], or limbs attached in unfamiliar places, but even bodies with different numbers of limbs [lobster avatars]". Dean Eckles generalizes this notion even further - in a 2009 blog post reviewing a 2006 article by Lanier on homonucular flexibility (which offers more details about the lobster) - to distal attribution: our propensity for attributing sensory perceptions to internal or external - or proximal or more distant - sources. Some [students] were turned into molecules, dancing and squirming to dock with other molecules. In this case the molecule serves the role of the piano, and instead of harmony puzzles, you are learning chemistry. Somatic cognition offers an overwhelming emotional appeal for education, because it leverages vanity. You become the thing you are studying. Your sensory motor loop is modified to incorporate the logic of a science, and you develop body intuition about that logic. [Knorr Cetina] looks specifically at knowledge objects, and how they are increasingly produced by specialists and experts rather than through a broader form of participatory interpretation. She argues that experts' relationships with knowledge objects can be best characterized by a the notion of lack and a corresponding structure of wanting [emphasis hers] because these objects "seem to have the capacity to unfold indefinitely": new results that add to objects of knowledge have the side effect of opening up new questions. This perpetual unfolding gives rise to "a libidinal dimension or dimension of knowledge activities" - an "arousal" and "deep emotional investment" - by the person studying the knowledge object. As an example, she describes the way that biologist Barbara McClintock, who won the Nobel Prize for her discovery of genetic transposition, would totally immerse herself in her study of plant chromosomes, identifying with the chromosomes and imagining how they might see the world - evoking an image (for me) of object-centered empathy more than sociality. The prospect of empowering future Nobel laureates with virtual reality technology to engage with and virtually embody objects of knowledge at an early age is very exciting. Lanier mentions the Kinect camera for Xbox 360 made by Microsoft (his employer), which will likely put virtual reality technology in the hands (or homes) of millions of people in the near future. The primary emphasis of Kinect marketing is on fun and games, but based on Lanier's article, and Knorr Cetina's insights into object-centered learning, Kinect might also provide a platform for a new approach to education. In an ideal world, of course, fun and learning would not be such distinct concepts ... perhaps this new technology will help promote a new dimension of convergence in the not-too-distant future. As I noted in my notes from UbiComp 2009, I missed a few sessions during the last day of the conference so I could explore more of Disney World, taking advantage of my free birthday pass to look for examples of how interactive displays were used to enhance guest experiences at Epcot Center. It felt a bit odd to be spending [part of] my birthday alone at Disney World, but as I noted in my earlier post on pins, positivity and practices at Disney, I was sporting my "Happy Birthday!" button during part of the day, so although I was alone, I didn't feel [as] lonely. 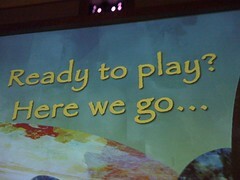 I'd heard reports of an interactive game on big screens for those waiting in line for Soarin', so that's where I went first. The line was the perfect length when I arrived - I was able to walk right up to a point at which the first few of the five giant screens was visible, and the line had just started moving, so I was able to advance to the edge of that first screen before the line stopped. The displays appear to operate in two modes: ambient and interactive. In ambient mode, each display shows a different sequence of intriguing landscape sketches, accompanied by music that I might characterize as reflective and complex. 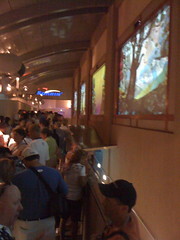 One of the interesting effects of this mode is that as the crowd enters this area, they shift from being rather boisterous and chatty into a somewhat more subdued state; the attention of many of the people in the queue seems to shift from their family and friends to the images and music. 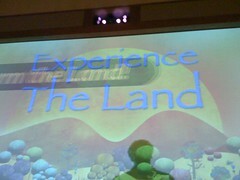 After about five minutes of ambient mode, the displays shift to interactive mode, wherein the people in line are explicitly invited to play a game, in this case, "Experience the Land". 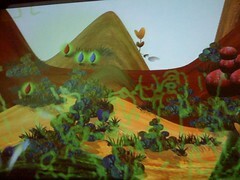 In each game, the projected images are influenced by the actions of the people in line. According to a report on Soarin' in AllEars, the interaction involves a combination of motion detection and heat sensing (another report alludes to infrared as the underlying technology). Silhouettes of [parts of] people in line are projected onto the screen, and as they move around and/or wave their arms, they affect the story unfolding on the screen. 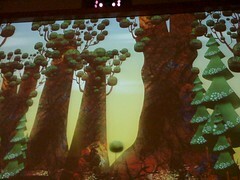 In the first game, "Form the Land" (shown on the left below), people's movements help to "push up" regions of virtual landscape into virtual mountains; I kept using my hand in a pushing up motion, but seemed to reach plateaus in some of the formations. In the second game, "Grow the Seeds" (on the right), waving physical hands over virtual seeds helped sprout the seeds into virtual plants; I suspect that additional waving helps grow the plants, and I was biding my time between sprouting new plants - requiring jumping to get the ones high up (perhaps these are within standing reach of people in line that are farthest from the screen, and so I may have been hogging the ball, so to speak) - and tending to existing plants, but at one point I inadvertently hit the person next to me, so I curbed my enthusiasm a bit after that. The entire two-game sequence lasted about 5 minutes - about the time it takes for the Soarin' ride itself - and then I was in line for another 5 minutes of ambient mode before reaching the final destination, so I suspect that the queue is designed to toggle between ambient and interactive modes every 5 minutes, and if you have to wait 10 minutes or more, you get to try the game at least once. I have since read an Orlando Sentinel blog post - Soarin' queue games a hit - which references "a bird game" so I suspect that there are a set of different games that are - or have been - provided for those waiting in line for Soarin' (and a more recent report in the Orlando Sentinel - Wait may be more fun at Disney's Space Mountain - suggests that an "interactive queue" and "audio-visual upgrades" may be included in the rehabilitation of that ride). Update, 2009-11-11, via BoingBoing: a new post on Disney Parks Blog about "Walt Disney World’s Classic Space Mountain Attraction to Reopen with a Few Surprises" includes some updates and photos, from which excerpts are included below. Had I known about the possibility of multiple games at the time of my visit, I would have looped back through, just to see whether I could try another game. The post describes some group dynamics - "many people were yelling, in unison, 'lean left!' and 'lean right!' while trying to lead the bird through the forest" - that I did not observe in the Experience the Land games, so if I were to go through the queue again, I would also explore more of the collective dimensions of play in this context. There is a debate in the comments on that post about whether the game ultimately makes the queue move slower - i.e., whether people are so absorbed in the game that they don't move forward as the line opens up. While I was there, the timing was such that movement seemed to take place only when the game was not in play; I'm not sure whether this was a game feature added after the initial roll-out or was part of the original design. After searching around for some other uses of displays, I decided to take a break from my field exploration in order to attend the closing keynote and post-conference UbiComp steering committee meeting back at the Disney Conference Center. Fortunately, this was within easy walking distance. I was then shown my freshly semi-customized video from the future, which given the constraints imposed by the questions and multiple-choice responses, represents an example of user-influenced content vs. user-generated content. A further constraint I encountered is that the Disney site does not permit embedding, so I downloaded the video, uploaded it to YouTube and embedded it below. I'll also include a transcript of the narration. Interestingly, in this context, the video includes a number of displays, including a portable medical scanner, a portable smart health card reader / display (shown in the keyframe for the video below) and a wearable cast-mounted display for monitoring / expediting the healing of a broken arm mended by a microscopic (or perhaps nanoscopic) robotic team. I don't know how the video might have been affected had there been another real passenger in the car providing input to the questions above, but my assigned virtual co-star in the movie appears to bear the brunt of the health problems we encounter during the episode. Welcome to the future ... or should I say _your_ future? Don't worry, with your take charge attitude, you are prepared. A portable medical scanner analyzes the situation. Fortunately, your entire history is with you at all times on a smart card. Your first day might include nanotechnology, a microscopic robotic team that fixes the injury from the inside. And while you relax at home with a cup of soup, technology speeds recovery time. In no time at all, you're back on your feet. Uh-oh [video shows another icepack breaking up under skis]. Fortunately, in the future, help is never far away. The end ... or should I say the beginning ... of your future. 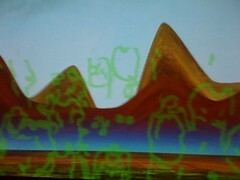 After disembarking from the ride, I entered an area dominated by a large spherical display of the earth, with photos of the people emerging from the ride momentarily superimposed on the display, after which the photos are whisked away to the points on the earth representing their hometowns. 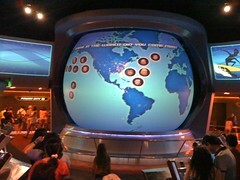 Surrounding the globe are a collection of large rectangular displays showing the keyframes for the semi-customized videos that had been produced by recent riders, and a set of kiosks at which riders can find their videos from the future and send them to themselves - and one other person - via email. I found myself wishing I could have simply swiped my magnetically-striped Disney card rather than having to manually enter my email address on the touch-screen (and waiting in line in order to even get to a free kiosk). 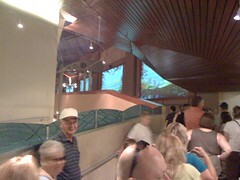 I'll include a Flickr slideshow of the sequence of events - and displays - encountered at Spaceship Earth below. One of the interactive games I heard about, but did not experience first-hand, was the Kim Possible World Showcase Adventure, in which players use their "super-secret Kimmunicators—interactive, handheld, cell-phone-like devices that help maneuver agents through their mission". This was a game that encompasses several screens - the screens on the hand-held devices, as well as larger screens at different pavilions around Epcot. One reason I didn't try it is because I heard several reports about the game being boring (for adults) and crassly commercial - many of the adventures are designed to lure the agents into specific areas of the shopping areas of the various pavilions. The other reason was that, it being my birthday, I wanted to take some time off from my field study to simply enjoy other dimensions of the guest experience, such as the warm weather, a beautiful sunset - a more naturalistic, but less interactive, public display of sorts - and the tasty margaritas I discovered around the Mexican pavilion. Digital artist Camille Utterback makes installations that combine cameras, projectors and custom software to create interactive, playful paintings. Stand in front of her work, and you’ll soon be waving your arms, walking around, spinning or hopping to figure out how your movements get translated into the abstract, colorful strokes on the screen. Influence in Digg Nation: Democracy, Meritocracy or Aristocracy? There appears to be rising indignation in Digg nation over the perception that some users have undue influence in the ranking of articles posted in this popular "user driven social content website" (cf. articles at InformationWeek, Wired Blog, and Wikipedia, the last of which also notes that "diggnation" was one of the names originally considered for the site). Any registered Digg user can add an article to the Digg news pool, and any Digg user can rate that article: digg it, which increases the rank of that article in the pool, or bury it (along with the justification: duplicate, spam, wrong topic, inaccurate, or lame), which decreases it's rank. Articles that receive enough diggs appear on the front page, and their placement on the page is based, in part, on Digg user rankings (other, undisclosed, elements are included in the Digg ranking, presumably including recency of votes). Users can also blog about, email or comment on articles, as well as rate others' comments with a thumbs up or thumbs down (and the ranking algorithm may also take some of these factors into account). 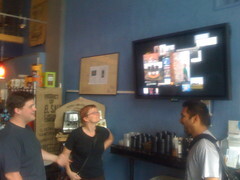 And, users are encouraged to invite their friends to join ... which is, in part, the source of the current controversy. In a recent blog post, Digg the rigged?, jp shared some observations, statistics and analysis about how a small group of Digg users was responsible for a large number of front page articles (Jacob Gower had earlier raised similar issues on ForeverGeek). jp reports patterns of digging by a small group of friends that quickly promote articles up the front page, and while he acknowledges that Digg is a "true democracy", he notes that, in practice, a "small aristocracy" appears to wield disproportionate influence over the system. The Digg user interface includes a summary of friends' activity over the past 48 hours, including counts of the stories friends have dugg, agreed on (stories that more than one friend dugg), dugg upcoming, commented on and submitted. [The screenshot from the left is from Wikipedia -- I don't have any [Digg] friends.] It's easy to imagine how friends might naturally check to see what their friends have dugg, and if they share similar interests, they would be likely to digg the same articles, so this disproportionate influence may simply be an innocent instance of the network effect ... or, more specifically, Metcalfe's law, which states that the value of a network is proportional to the square of the number of its members. However, it's also to imagine how a group of friends may intentionally "game" the system. I'm reminded of an incredibly insightful presentation on Putting the Fun in Functional, given at eTech 2006 by Amy Jo Kim, Creative Director at Shufflebrain, that I read about at we-make-money-not-art. Amy Jo highlights five key elements that can make online games engaging to the point of addiction -- collecting, earning points, feedback, exchanges and customization -- and notes how many online social networking services (e.g., MySpace), exhibit all of these elements ... and thus may be considered games, broadly speaking (contributing to my own sense of the growing pervasiveness and permeability of games worlds). Digg exhibits these five elements, and so it would hardly be surprising if some users -- and groups of users -- would make a game of promoting news and infotainment. Kevin Rose recently announced some changes in the Digg ranking algorithm that are intended to promote diversity, through differential weighting of diggers' influence based on how diverse their diggs appear to be. I see this as an attempt to shift from a pure democracy to something more of a meritocracy, where behavior deemed undesireable is penalized, whether that behavior is intentional or uninentional. This shift may address some of the concerns, however, I suspect that if the gaming is, indeed, intentional, then the gamers will find a way to accommodate this -- perhaps a network of networks of friends that can help each other diversify via pseudo-random diggs. Years ago, my colleagues and I at Accenture Technology Labs confronted similar issues regarding how best to allocate influence over a shared resource. We were designing a system, MusicFX, to enable people to influence the music played in the fitness center while they were exercising. The system offered fitness center members the opportunity to create a profile of their musical preferences based on a 5-point scale, indicating whether they love, like, don't care, dislike or hate each of 91 different genres of music (via DMX). As each person entered the fitness center to workout, they badged in to identify themselves, and their preferences were added to the pool from which the "best" music would be selected. We witnessed some gaming of the system shortly after deploying the system at the Accenture Technology Park fitness center (where it continued to run daily for over 4 years, until Accenture sold the building in 2001). On the first day, one user used the interface kiosk we setup in the center to change his rating of the genre that was currently selected from "don't care" to "hate" (similar to the "bury it" rating in Digg). This had the effect of a veto, given the way we had configured the algorithm weights at the time, and the station was immediately changed. The user repeated this process a few more times until he had vetoed the stations he didn't like, and the algorithm had settled on a station he did like; then he went back to working out again. That night, we changed the settings to ensure that no one could wield veto power. The next day, this user called his friends in the fitness center over to demonstrate his new-found veto power, and was rather chagrined to discover that the system no longer responded so instantly and dramatically to his preference changes. We considered a variety of elaborate weighting schemes to try to achieve greater diversity, both respect to the different musical preferences of the members and the variety in music genres selected. We setlled on simply introducing a weighted random selection operator that would select one of the most popular genres, but not [always] the top rated one; this provided greater diversity without the additional complexity in the algorithm -- or in the models users had about how the system worked. At one point, in our near-obsessive concern over fairness, we went so far as to design a market-based version of MusicFX, where we setup virtual emotional bank accounts for each user, and devised a system through which virtual money would be transferred from the accounts of users who liked or loved the music that was being played to the accounts of users who disliked or hated the music being played. We instituted regular bidding cycles in which virtual agents for the users would bid on music genres, where the cost of the genre was based on its popularity; over time, people who had outlier preferences would eventually accrue enough capital to outbid the people with more "normal" preferences, and get to hear their music. In simulations, we found that the market-based version resulted in a more equitable distribution of "wealth" (where wealth = listening to music you like or love) as compared to the non-randomized regular version, but when the smidgen of randomness was added to the regular version, there was not much difference in equitability. When we considered the potential negative impact on the overall fitness center population to occasionally hearing genres that most people hated, we decided not to implement a real-life trial of the market-based system ... the trade-off between conducting good science and maintaining good service (for a deployed system). Anyhow, I mention all of this, not only because MusicFX was one of my favorite projects (I could spend pages and pages telling more stories about our experiences with the system), but also because I think some of those lessons may apply to the current challenges Digg faces in reallocating influence among its population of users. I think that if they overly complicate the model, it may turn off some of their regular users, who won't know why their diggs don't seem to count for much anymore, and anyone who is intent on gaming the system will find a way to do so. The changes run the risk of harming the "innocent" without accomplishing the goal of effectively deterring the "enemy", though Digg nation would certainly not be the only nation in which ineffective overreactions to low probability threats are taking place. The Microsoft Research Social Computing Symposium this week highlighted the pervasiveness of games and raised a number of questions (for me) about the thin membrane between games worlds and so-called real life. I was also reminded of a number of themes I first encountered years ago in a delightful and insightful book, Finite and Infinite Games: A Vision of Life as Play and Possibility, by James P. Carse. I'll share a few highlights from the symposium, briefly note a related topic that wasn't formally discussed at the event, and conclude with some [relevant] highlights from the Carse book. This year's symposium, organized by Liz Lawley, innovated in at least two dimensions. One was its dual focus on online third places --primarily, massively multiplayer online games (MMO[G]s) -- and mobile social software -- a category which includes mobile game applications. The second was the use of open space technology, where there were a few short lightning round presentations and a number of open sessions where people could propose discussion topics (online or offline) and recruit discussants. And with WiFi, a wiki, IRC, IM and a critical mass of World of Warcraft (WoW) players in the room, there was at least as much discussion going on in the backchannels as in the frontchannels (this level of activity at the first symposium prompted danah and me to organize a panel and write a paper about digital backchannels in shared physical spaces ... now it seems routine, at least among this crowd). Constance Steinkuehler talked about third places and education, embodied empathy in complex systems, MMOs as a gateway drug (to education), and the Christian Rock Problem (the tension between institutionalization and transgression ... or, perhaps, piety and play). Tim Burke made the case for sovereignty (the open and transparent use of rules, reminiscent of chaordic leadership principles) vs. "veiled" management as a form of governance in games. Nic Ducheneaut noted that a large proportion of WoW players spend significant portions of time alone together (a digital world version of a physical world practice), and suggested online games need new tools for non-instrumental communication to support indirect sociability. Andy Phelps raised the walled garden problem with respect to the challenges in moving groups / guilds from one game to another, or even from one server to another within the same game. Dan Hunter defined property as an abstract concept which is embodied in law, and noted that because of persistence, resource scarcity in game design, economies and property emerge in MMOs. Clay Shirky claimed that the magic from inside the magic circle (the membrane between game world and rest of life) doesn't extend to the rest of life, because MMOs are sites of participatory value rather than productive value. Rich Ling emphasized the importance of ritual (with its basis in mutual focus, effervescence, and power structure), and argued that mobile phones, with their support for informal coordination, will affect social cohesion more than the "traditional" Internet. Dina Mehta illuminated the emerging market in India, where there are 75M mobile phones, growing by 1.5M each month, and SMS is the preferred channel, noting that 55M text messages were sent to a number associated with the television show Indian Idol. Daniel Pargman shared some stories about Botfighter, a location-based game using mobile phones, including one high-speed car chase in the physical world to escape missiles fired in the virtual world (which would seem to raise the stakes considerably in the debate about the risks of using mobile phones while driving). Cathy Beaton stressed the importance of designing technologies for people with disabilities, noting that other users are, at best, Temporarily Able-Bodied (TABs), and expressed concern that students may not be sufficiently responsible to make wise choices in their use of wireless technologies in a classroom environment (and I was not the only one in the room -- reverberating with keyboard clickety-clacks -- who was wondering why she was restricting her focus to students [in a classroom]). Howard Rheingold asked how we could [better] cultivate the backchannels to support education, and highlighted what I considered to be the most inspiring use of mobile telephony for social causes I heard at the symposium: a global early-detection and early-response system for infectious diseases, pioneered by Larry Brilliant, which would, in effect, deputize smart mobs of health monitors worldwide. Fernanda Viegas presented some compelling visualizations of the evolution of pages in Wikipedia, described the process of peer review for featured articles (prompting me to think about peer review as yet another instance of a game), noted the increasing bureaucracy in the process, and asked whether this is [necessarily] a bad thing. Judith Donath provided what was, for me, the largest spark at the event: her invocation of signaling theory to capture and explain identity and interactions in online and offline worlds, and, quite possibly, between the two (during her talk, I kept thinking of the bumper sticker "Lord please help me to be the person my dog thinks I am"). Scott Golder (one of three of Judith's former students presenting, along with Fernanda and Karrie) proposed the provocative idea of socialist computing, asking whether we can support shared ownership through social computing, and offering the examples of cohousing.org, prosper.com and Netflix. Karrie Karahalios pointed out that much of the focus in social computing is on text and video, noted that we have spent thousands more years talking than writing, and suggested audio as a social catalyst and tool for revelation. She also shared an observation that resonates strongly with me: the more you talk, the more you discover about yourself (as I increasingly recognize that I preach what I want to practice). Clay Shirky gave one of the closing keynotes, presenting some ideas about a pattern language for online spaces, and noting how different patterns are embodied by different tools, on different sites and for different purposes. danah boyd gave the other closing keynote, weaving together some threads from her studies of friendster and MySpace, noting the importance of embedded design[ers] (people living in the culture they are supporting) and observing that teenagers are essentially "microcelebrities with their own Reality TV shows on MySpace" (one of my favorite one-liners from the event). Elizabeth Churchill and Wendy Kellogg jointly presented the closing keyphotos, a lighthearted review of some of the interesting moments during the event -- a lightening round, perhaps --punctuated with some remarkable photos (and captions), some of which can be found via Flickr tag scs2006. I participated in several interesting and far-ranging breakout session discussions, on the topics of reputation (proposed and led by Gary Flake), social computing tools in the enterprise (Ross Mayfield) and linking physical objects to digital information (Ulla-Maaria Mutanen), but those discussions will be best re[p]layed in separate breakout blog posts. I had proposed a topic for one of the open sessions (online, but not offline), but was so interested in another topic proposed for the same session that I decided to join the other discussion. I also found that by simply posting this topic beforehand on the wiki, I was better prepared to discuss it informally in 1:1 and small group gatherings during breaks. Since the wiki was only available to participants, I want to post it here, in case anyone reading this has any insights they want to share ... er, not that I want to assume that anyone will have [had] the stamina to read this far. The basic issue is permeability. A number of observers and analysts have noted the positive aspects and effects of engagement in online worlds, e.g., in Dream Machines, the guest editor introduction the recent Wired special issue on The New World of Games, Will Wright contrasted the online and offline worlds, noting a focus on creation vs. consumption, cooperation vs. competition, and participation vs. passivity. In another article, You Play World of Warcraft? You're Hired!, John Seely Brown and Douglas Thomas extol the virtues of the learning to be that takes place in online worlds (vs. the learning about that typically takes place in traditional education in the offline world). Claiming that "the process of becoming an effective World of Warcraft guild master amounts to a total-immersion course in leadership" they make a strong case for how participation in MMOs can help people become more effective in the offline world. At the same time, there has been considerable debate about whether engagement in violence in online games creates an increased propensity for violence in the offline world, although studies have not been able to demonstrate a causal link (cf Eight Myths about Video Games Debunked). Which behaviors, skills and experiences -- if any -- transfer from the online world to the offline world (and vice versa)? If some, but not all, aspects of our online and offline activities and proclivities bridge the gap, what distinguishes those elements that do transfer (and why)? If there is a link, do activities in one space tend to satisfy or increase the desire for activities in the other, and if "it depends", what does it depend on? A finite game is played for the purpose of winning, an infinite game is played for the purpose of continuing the play. The joyfulness of infinite play, its laughter, lies in learning to start something we cannot finish. And that seems as good a place as any to finish this post.